Product Sales and Viewing by Appointment MONDAY to SATURDAY During Daylight hours. Closed Sundays and Stat Holidays. *New* Paddleboard Section! Click Here and check it out. 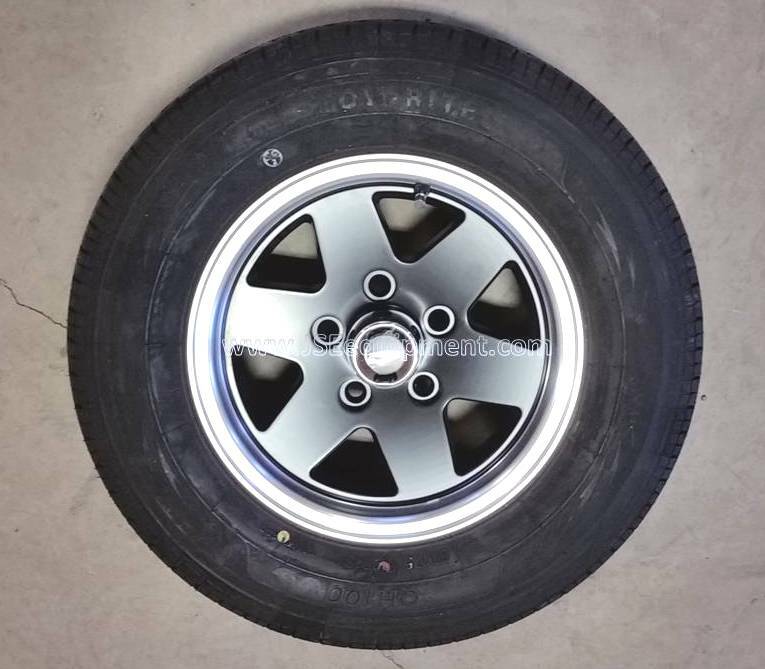 IN STOCK *Limited Quantity Only 3 left!, Special Buy* 15" Trailer Wheel ST205/75R15C Radial Tire, 1820 lb Capacity, 5 Bolt with 4.5 Diameter mount holes, TOW RITE Brand, White Spoke Style Rim. 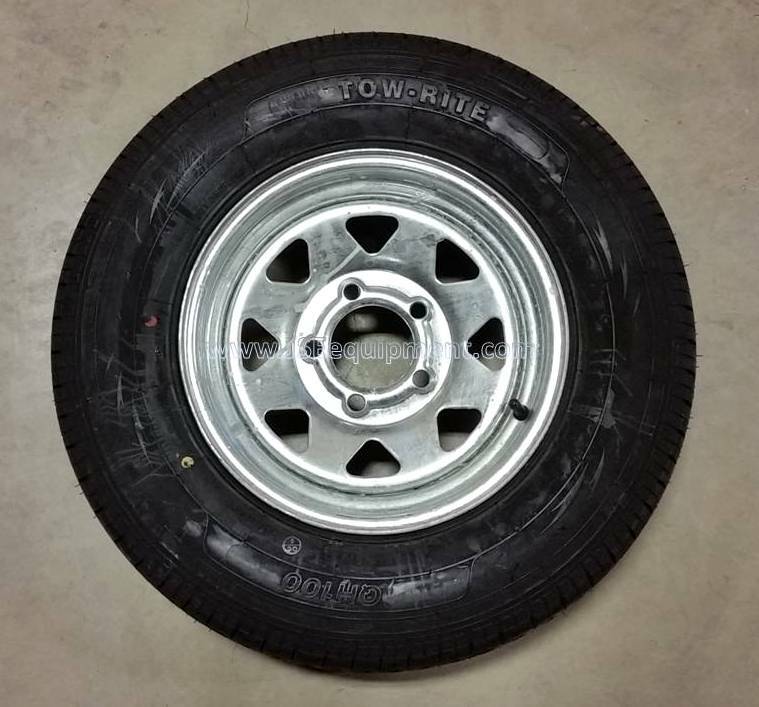 IN STOCK *Limited Quantity 4 left, Special Buy* 15" Trailer Wheel ST205/75R15C Radial Tire, 1820 lb Capacity, 5 Bolt with 4.5 Diameter mount holes, TOW RITE Brand, Galvanized Spoke Style Rim. 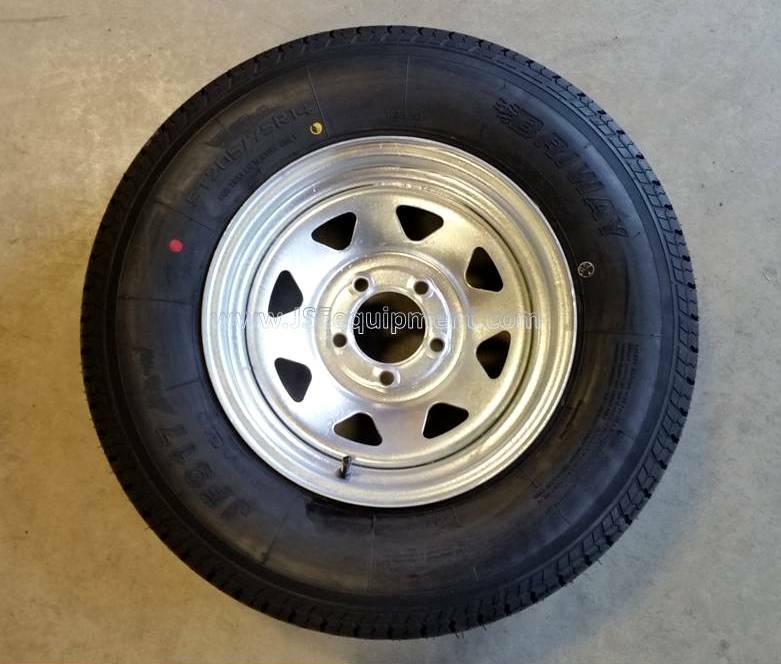 *USED AS-IS* 52"w x 88"L Utility Trailer with front and rear extendable gates, Manual Tilt / Dump Bed, Hole cut out in front gate to carry a snowmobile, Trailer weight 450 lbs, GVW 2000 lbs, Carry Capacity 1550 lbs, Overall Width: 77", Overall Length: 136", Quick Release Gate Pins, Full Metal Floor, Quick Lube Hub, Heavy Duty Light Protectors, 2" coupler, 4 prong electrical hook up, front flip down gate to extend carry length. Heavy Duty Sport Boats: High quality and affordable, the Salter Sport boat is available in 3 sizes, the 9ft 270, 10.5ft 320, and 12ft 360. Available with aluminum, or a high pressure air floor, All floors offer solid rides, light weight aluminum seats, increased thickness and durability boat material at 1.2 mm thickness. Boat Features: Heavy duty fiberglass laid transom, 4 Separate air chambers, One-way rear drain valve, Safety pressure valves for over inflation, 15 Stainless steel D-rings, 6 Handles, Reliable flush valve with inside push lock, Top Trim,1.2mm material thickness. Accessories Included: Lightweight aluminum seat benches, Repair kit, Locking oar's, Aluminum Floor insert, Foot air pump with adapter for H-R valve, Storage/Carrying bag, Towing rope, 5 bottom rub strips. Karavan Single Snowmobile Trailer, 13" Wheels, Carrying Capacity: lbs, Approx. Curb Weight: lbs, Cargo Deck: 10'L, OA Width: 72", 1/2" Marine Grade Plywood, 1 TD Bar, 2" Coupler, 4 prong flat electrical. Features: Trailer folds and stands up out of the way, Bottom rolling casters, Upper and lower removable racks to hold Canoe's, Kyaks, or Paddleboards, Motorcycle style wheels with mounted spare under the deck, Dual independent Coil Spring axle suspension, Approx. 450 lb carry Capacity, 2" Coupler, 4 Prong electrical hook up. Extended tongue kit installed, Included Tongue foot. JSE Equipment is a family owned company, we buy and sell new and used equipment. 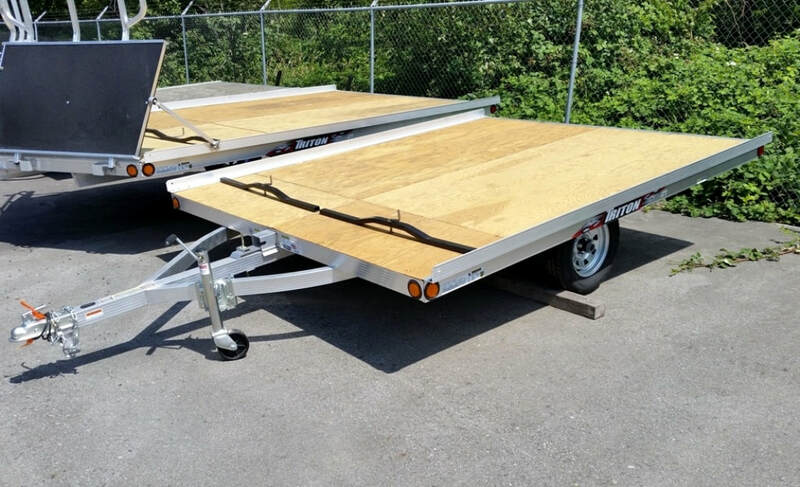 We are located close to the Maple Ridge / Mission border, Products we currently deal with are; Cargo Trailers, Utility Trailers, ATV/UTV Trailers, Truck Decks, Motorcycle Trailers, Boat and Watercraft Trailers, Small Aluminum car topper boats. We do not sell any powered road vehicles or any RV living quarter units. Low overhead means savings for the customer! We service our customers by Appointment Mon. - Sat. rather than hours of operation. 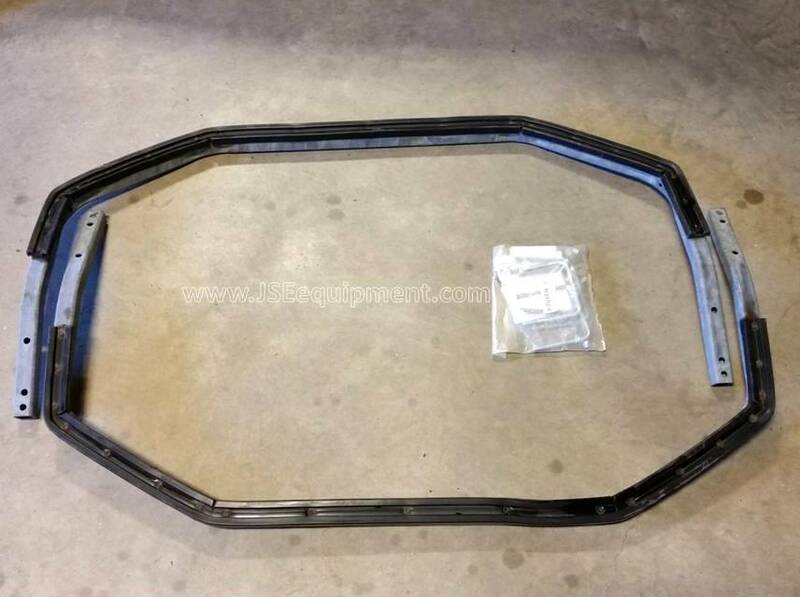 JSE Equipment is a Dealer for H&H Trailers, Marlon Recreational Products, Karavan Trailers, EZ Loader Boat Trailers, Salter Watercraft Products, Triton Trailers, Shoreline PWC and Boat lifts, Western Marine Products, 5 Seasons Accessories, CECO Wheels and Accessories. See pages for inventory or put your special request in today.